Father Albert Sayson was born in 1962 in Naga City, Philippines. He studied in a Catholic school run by Chinese priests. This school provided students a venue to grow in faith and to be involved in church work as altar servers or members of the school choir. He served as an altar boy right through his high school years and continued to work as a convent boy during his first year of university. After almost a year, he was encouraged by Fr. Joseph Chen to attend a vocation campaign search. Out of curiosity he participated in the gathering and following that began to pray for guidance to take the entrance examination to enter in the seminary. 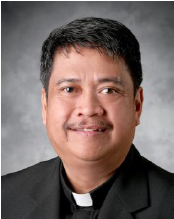 He was ordained to the priesthood on May 8, 1993 in Taytay, Rizal, Philippines. His first assignment in the Diocese of Calgary was as the associate pastor of Holy Family, Medicine Hat, in December 2014 until his move to All Saints Parish.